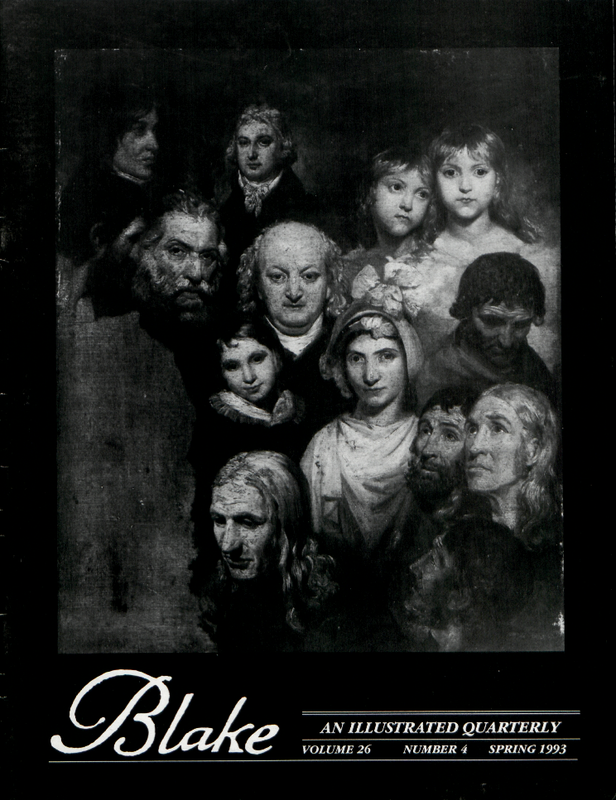 Cover: William Blake and Other Portrait Studies, attributed to Thomas Phillips (1770-1845). For details, see page 148. Photo courtesy of Sotheby’s London. G. E. BENTLEY, JR., of the University of Toronto, works with his wife, Dr. E.B. Bentley on Blake biography, bibliography,[e] and editions and illustrated books of Blake’s time. ROBERT N. ESSICK is the co-editor of William Blake: The Early Illuminated Books (with Morris Eaves and Joseph Viscomi) and William Blake: Milton and the Final Illuminated Works (with Joseph Viscomi), vols. 3 and 5 in the new Blake Trust series (forthcoming late 1993). MORTON D. PALEY is co-editor of Blake. He recently edited The Last Man by Mary Shelley for Oxford World’s Classics. MARGARET STORCH is the author of Sons and Adversaries: Women in William Blake and D. H. Lawrence, and is a member of the Commonwealth of Massachusetts Higher Education Coordinating Council. She is currently working on motifs in the visual art of Blake and of D. H. Lawrence. JOHN VICE works in the House of Commons for Hansard, the Official Report. He is currently writing a full-length biography of Jacob Bronowski.